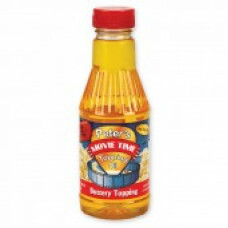 HTD Canada Theater Popcorn Buttery Topping is a rich buttery flavored topping oil that designed to be heated and poured over freshly popped popcorn. Hot buttered popcorn is a taste treat that should not be reserved just for the movie theaters, now you can add this buttery topping as your finishing touch to your homemade popcorn. Packaged in a air tight reusable container for maximum freshness, you will yield approx. 32 servings.